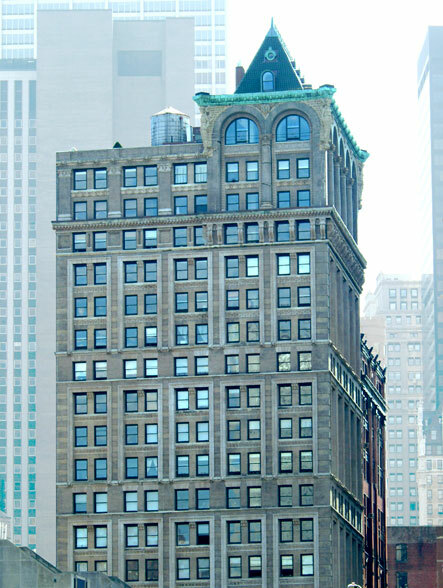 This imposing 23-story building is directly across Spruce Street from the entrance to Pace University and it overlooks both City Hall and the Brooklyn Bridge.Erected in 1895 as one of the city's tallest and largest towers, it was designed by Robert Henderson Robertson and was designated an official individual New York City landmark in 1999. It is one of the earliest steel skeletal frame skyscrapers in the city. It is clad in rusticated gray Westerly granite, gray Haverstraw Roman brick, and buff-colored terra cotta. It has a u-shaped plan with an exterior light court on the south side. Its design is a combination of Romanesque and Renaissance Revival styles. Its two main facades are divided into six horizontal sections and a three-story arcade, open at the top story and with winged caryatids at the upper corners, tops the western half of the building and a three-story hipped roof tower rises through the arcade creating an unusual top.The building is notable for its deeply inset windows, the superb lions' heads on its stringcourses and its fine monumentality.This building has four apartments per floor and a duplex penthouse.The building has a common roof deck, and a fitness center, and an exposed rooftop watertank. Please upload copy of cover letter. Please see attached for more information. Please complete the Purchase Application(enclosed). Financial Statement and Itemized Schedules. Complete with supporting documentation (enclosed). Notice to the Board of Managers of 150 Nassau Street c/o Douglas Elliman Property Management stating that you have received a bona fide offer to purchase your unit. Said notice must include the name and address of the party making the offer to purchase your unit, and the terms of the proposed transaction. The giving of such notice to the Board shall constitute an offer by you to sell your unit to the Board or its designee. Upon the same terms and conditions as contained in the proposed contract and shall also constitute a warranty and representation by you that you believe the offer to sell your unit to be bona fide in all respects. Upload Copies of the last two (2) years Federal Income Tax Returns complete with W-2 forms; if self employed, letter from CPA stating annual income or a profit & loss statement. Upload copy of Employment verification letter stating position, salary, and length of employment. If financing, a copy of the Commitment Letter. Upload copy of One (1) business letterof reference per applicant. National Tenant Network Credit Authorization Form (enclosed). Notification of Closing Form to be sent to Douglas Elliman Property Management immediately after your closing (enclosed). Residential Rules and Regulations Acknowledgement (enclosed). A copy of the Residential Rules, Regulations and Resolution are enclosed for informational purposes only. Fully executed lease agreement (must be Blumberg Form A101-enclosed). Please complete and sign the attached form. Notice to the Board of Managers of 150 Nassau Street c/o Douglas Elliman Property Management stating that you have received a bona fide offer to lease your unit. Said notice must include the name and address of the party making the offer to lease your unit, and the terms of the proposed transaction. The giving of such notice to the Board shall constitute an offer by you to lease your unit to the Board or its designee. Upon the same terms and conditions as contained in the proposed lease agreement and shall also constitute a warranty and representation by you that you believe the offer to lease your unit to be bona fide in all respects. Upload Last two (2) months bank statements along with last months Pay Stubs. Upload Employment verification letter stating position, salary and length of employment. Upload copy of a scanned photo identification (i.e. drivers license, passport, government issued ID). Upload One (1) business letter of reference. Upload One (1) personal letter of reference. Pet Approval Form, if applicable (enclosed). Residential Rules and Regulations Acknowledgement (enclosed). A copy of the Residential Rules, Regulations and Resolutionare enclosed for informational purposes only. Lead Based Paint Disclosure Forms (enclosed): The disclosure documents must be completed in their entirety and submitted for review with the Board Package.The Board Package will not be sent to the Board of Directors for review unless the Lead Based Paint Disclosure documents are included. NO EXCEPTIONS will be made. Enclosed is a summary of the Lead Based Paint Disclosure Information. Upload Evidence of the Unit Owners insurance coverage. Upload Evidence of the prospective Tenants insurance coverage.